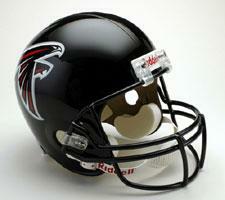 Atlanta Falcons Helmet 2003-Current Deluxe Replica Full Size by Riddell | Sports Memorabilia! Atlanta Falcons 2003-Present Deluxe Replica Full Size Helmet by Riddell. This helmet comes in official team colors, uses the same steel, polyvinyl-coated Z2B facemask as an authentic VSR4 helmet. Interior padding is decorative, not functional. Includes a 2-pt chin strap.